It is 2019 and it is spring time in Vienna again. The night train from Hamburg to Vienna was as always a great experience and so the conference was set up for a good start. The sun is giving everybody a big smile (at least for the start) and so and eventful week lies ahead of us. The first day was fully covered for me by sea level science. The sea level session covered as always a wide range of topics. From reconstructions over land movements, from GIA to the political site of the problem. Unfortunately, my favorite topic, the palaeo-reconstructions were only covered by a very small number of talks (probably just one). I have also to get used to the new schedule of seven talks per session, but I will certainly write about it more later this week. 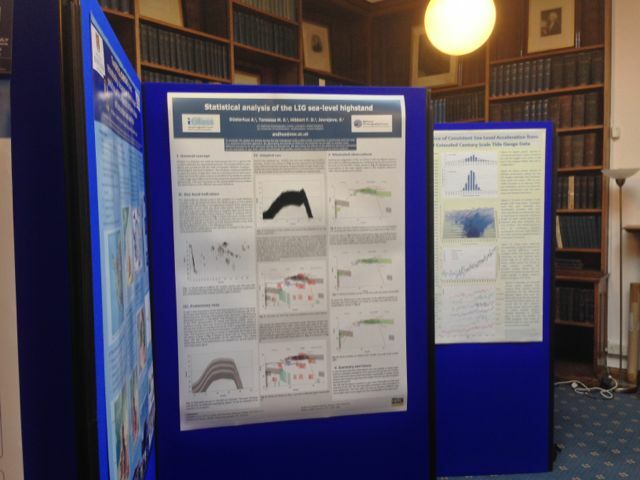 I also went to a poster session, which are now in parallel to the talk-sessions. So a lot of changes, which all need some adaptions. During the week I will have a talk and a poster, but both will happen towards the end. I am looking forward for many interesting topics, talks and posters and of course the most important part of a conference: meeting other scientists. Database paper background: What can the future bring? After the new paper got out the question remain what the future of palaeo sea-level and ice-sheet databases will look like. As this can be a wide-ranging topic, I would like to start with what I think will be the next developments, before talking about possible long-term aspirations. In the current situation, the best we hope for is that new site specific databases are getting better and better. Steps to this might be small, but new papers making use of databases will demonstrate that a better understanding of the data is necessary. To understand the data better, it is required to create more detailed databases, which consequently include uncertainty estimates and the limits of the data generation. One of these papers, written by me, is already accepted and will be out in the next days. Further ones by me and others will follow and demonstrate the need for these well prepared databases. Coming from this we can think about the future of general databases. So is it possible to create one access point for all available palaeo sea-level/ice-sheet data for a given time period? My answer is yes. It is possible, but many obstacles are still in the way. The most important one is long-term financing. To fulfil the ATTAC^3 guidelines it is essential that it can be guaranteed that data will be available in the long-term. The next step would be the setup of a trusted group of experts, which have the background to scientifically back decisions, which are required within the creation of large databases. Only when these two corner stones would exist starting of the technical development would be reasonable. Nevertheless, many critical points will come up. Is everybody allowed to contribute, or is only data published in journals suitable for such a database? What will be the data formats for exchange? How will the technical implementation guarantee the future suitability of such a database? And how can trust be built up? There are many problems in creating such a database and so I do not think that we will be there in the upcoming five years. Basically the funding problem is too problematic and will suppress possible advance in the field even longer. Up to then the combination of many different data sources will remain an issue and will hopefully not lead to too many wrong scientific results caused by bad raw data interpretation.